A poster on the event. 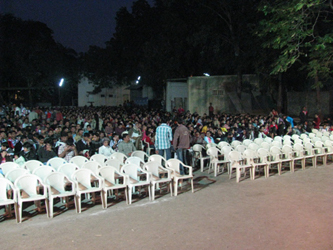 The venue was a large, exterior stage, built to the precise specifications of Manick Sorcar Productions. An estimated 1200 people witnessed the show. Another historic day - this time it is for the Ramakrishna Ashrama at Rajkot, Gujarat. The laser documentary on “Swamiji” created a stir again. “You brought him alive in the hour-long spell-bounding show", said Swami Sarvasthananda, the Secretary of Ramakrishna Ashrama, Rajkot, Gujarat. Earlier, prior to the show he felicitated Manick, his wife Shikha and each member of the group with gifts and warm wishes. The show started at 7:30 pm, with a lamp lighting ceremony. The event took place within the Ashram, on an exterior, large custom-made temporary stage, built to Manick Sorcar Production specifications. An estimated 1200 people watched the show. 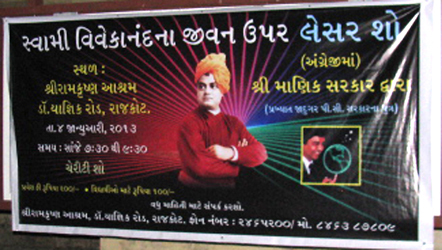 (Left) A poster in Gujarati language made it easier to read. (Right) A part of the crowd, before the VIPs in the first three rows were in. 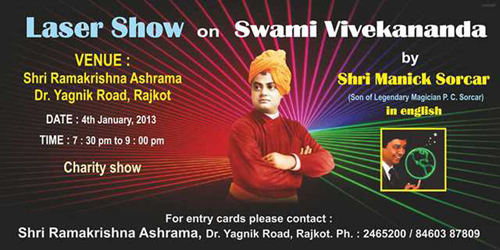 Attended your 'miraculous' laser show today at Sri Ramakrishna Ashram, Rajkot. It waas truly a wonderful show - in terms of technology, music/dance and of course the script. The incorporation of Swami Vivekananda's speech awakened our spirit. Being a devotee of the Holy Trio i felt as if i was very much living witth them. Hats off to you Sir for the presentation. We wish that you have many more shows here and abroad. Prerana Kirti: Sir, a "Historical Day" in Rajkot also.. Truly wonderful.. awakening and inspiring.. Wishes and many thanks..